Arte Italica features beautiful handmade Italian dinnerware, serveware, flatware, barware, and elegant kitchen accessories. Each Arte Italica piece is crafted using the finest materials, including high-quality pewter, hand-blown glass, glazed ceramic, and stainless steel. 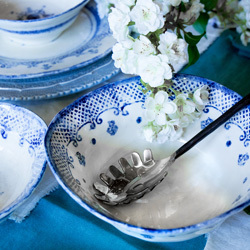 Browse vintage style pewter serving dishes, Old World style dinner plates, hand-painted serving dishes, and intricately designed soup bowls that are sure to make a statement on your table. 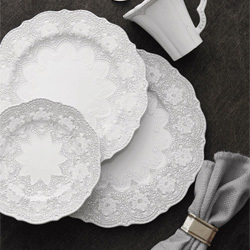 With hobnail detail, lace design finishes, and Italian pewter accents, Arte Italica creates beautiful pieces for entertaining and every day style. 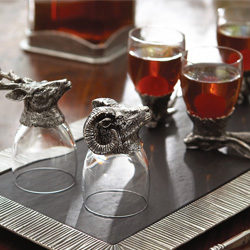 Add elegant flair to your bar with our collection of crafted handmade glasses, Italian pewter bottle openers, and intricately detailed decanters. 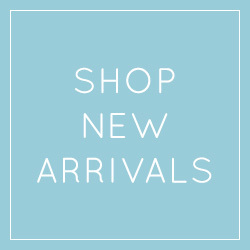 Find the perfect piece for your style at Peace, Love & Decorating! Ann Skidmore formed Arte Italica in 1997, in response to her love of Italian history, culture, art and especially vintage pewter. 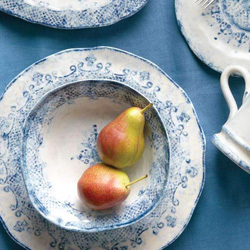 In 2000, Ann and Arte Italica became the first to combine pewter and ceramic into beautiful and unique dinnerware and accessories. Our Arte Italica collection includes pieces with innovative designs, colors and material combinations. By combining European-inspired designs with contemporary touches and a dedication to handcrafting, Arte Italica creates pieces that allow each collection to be truly one-of-a-kind. Another unique feature of Arte Italica is the collaborative aspect of their collections with one another in seemingly endless combinations. This versatility guarantees the uniqueness and longevity of their pieces. All Arte Italica products are final sale and not eligible for return. 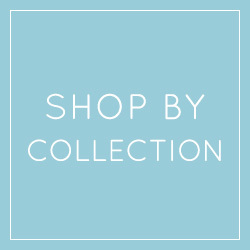 A 10% restocking fee may apply depending on the collection. If an item arrives damaged we will send a replacement for the original item ordered. 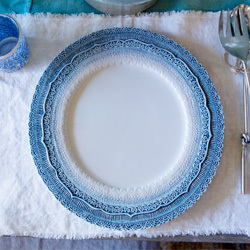 Ceramic Dinnerware & Serveware Our ceramic dinnerware collections are dishwasher safe on the low-heat, air-dry cycle, using non-abrasive detergents, do not overload the dishwasher. We recommend hand washing oversized serving pieces. 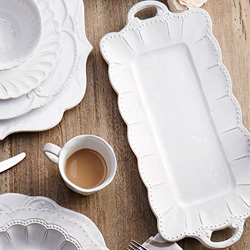 All of our ceramic collections are microwavable. 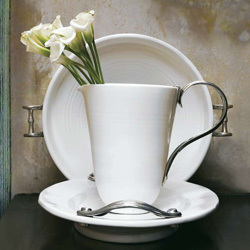 Ceramic Serveware: These serving pieces are hand wash only and because of the exposed rim are labeled not food safe. Ceramic Bakeware: Before first use, submerge the baker and lid (if applicable) in water for 12 hours. Always place baker in cold oven and allow it to heat gradually (max. 450˚). Always allow baker to heat and cool gradually. Decorative Ceramics: Many of our decorative ceramic pieces are finished with faux cracks, distressing, drips, color variations and/or fine lines in the glaze. Decorative garden containers should be brought indoors during freezing temperatures. Liners are recommended. To clean, wipe with a damp cloth. 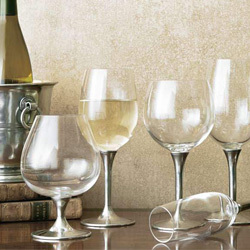 Glassware: These glassware pieces are hand wash only. Pewter: Pewter should never be used in the oven or microwave. Pewter is dishwasher safe on a low-heat setting. Please avoid abrasive or citrus-scented detergent. As with any metal, prolonged exposure to citrus, vinegar and other acidic foods can harm the finish of pewter, so please wash your pewter immediately. 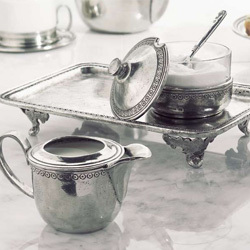 Pewter does not tarnish like silver, and rarely requires polishing. Pewter is a soft metal, and is susceptible to scratching. To remove scratches, simply buff gently with the finest grade "0000" steel wool. Pewter & Ceramic: Our pewter and ceramic dishes may be washed in the dishwasher on a low-heat setting, using a mild detergent. Abrasive or citrus-scented detergents should be avoided. This collection is not safe for oven, microwave or freezer use. 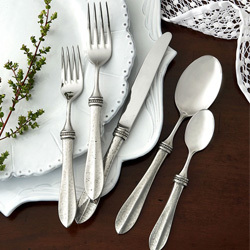 Pewter Flatware: Our pewter & stainless steel flatware collections are safe for the dishwasher. We recommend a non-abrasive detergent without citrus or perfumes (as these will mar any metals) and the low heat/energy dry cycle. Silver and Gold-gilded Items: Our gilded pieces should never be placed in the dishwasher, oven or microwave. Please hand wash with a non-abrasive detergent to ensure the beauty of the piece. 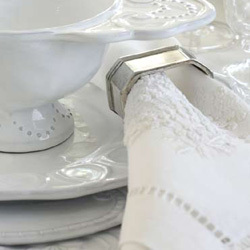 We recommend the use of a soft jewelry cloth to buff any tarnish that occurs naturally on our silver-gilded pieces.